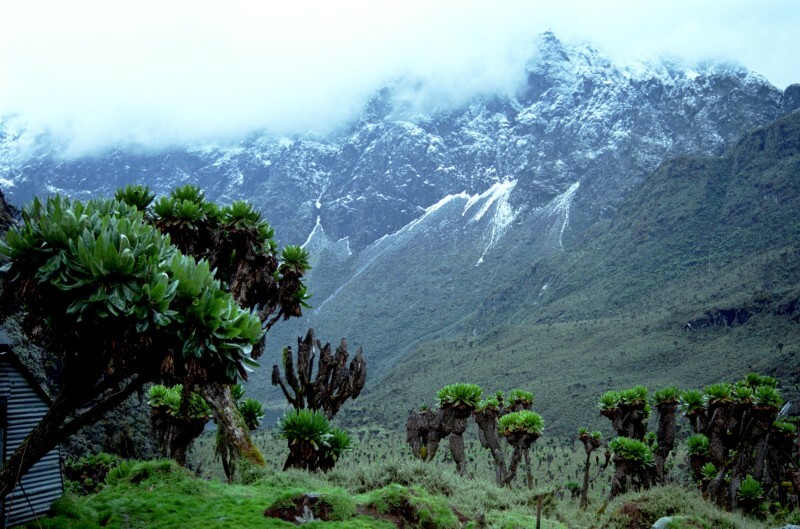 Rwenzori mountains, providing hot volcanic water for the hot springs of Lume. The 7R Future Leadership Institute has been following Belgian Floris Buter from the Virunga National Park on a week long field trip in Africa, in order to gather topography data for a hydro-power project. The collected data are to be wired to the Belgian engineering firm TPF. They need the data to make a feasibility study. However during his field trip Floris decides to leave the Virunga National Park project to set up a business servicing the Virunga National Park. Today you will read how he says goodbye to the rangers of the Park by ordering, killing and eating a pig and a small goat. I wake up and realise that I also have to celebrate my last days in the station with all the rangers. I call Kasaï and ask him if he can buy a small pig and a small goat. He makes a list of what we need and what it costs. I agree and he starts searching for the little pig and goat. I rearrange and order the stuff in my room and write some emails. At 11:00 o’clock I decide to go for a run. From Mutsora Station there is straight road going down through the village of Mutsora to the Mutwanga hospital. It’s a 1,5 km run down and then a 180 degree turn and back up. On my way up the idea grows to continue my jog passing the Station towards the hot springs, which are 2 km from the station in the southern direction towards the village of Lume. On my run I follow a small meandering path through the green. On the left, I pass the ancient jungle of the Park and on the right I pass cacao, papaya, palm oil trees, black beans and manioc gardens. I cross the small Taliha river and do a full body dip. Very refreshing. I climb 10 meters and thereafter I descend gradually until I get surprised by a sudden sharp bent in the path. The big tree that has been struck by lightning two years ago has finally given up. It lays flat on the ground crossing the old path which has become virtually invisible, overgrown by young plants. I take a new path and continue my way. I cross a small dry ditch via 5 small eucalyptus trees that form a bridge. After 5 meters, I take a left. Then a bend to the right, I go straight, a small bend to the left, I descend and there I see the hot stream. Manioc roots are laying in a pool to get rid of the acid and to get a little bit of the holiness of the hot springs. I cross the stream, take a left and arrive at the hot springs. The stones in the hot spring are positioned exactly on the right distance from the source so that the temperature is exactly right. I estimate it to be around 35 degrees Celsius. I take of my cloths (whoa!) and get in. There is nobody there at the moment, but since it’s a public place, at any time a Congolese guy can show up alone or with his friends just to enjoy the healing sensation of the hot volcanic water coming out of the Rwenzori mountains. It’s the middle of the day, so it’s already hot and the hot springs are making me a even hotter, so it’s time to leave and run back. I already look forward to jump into the cold Taliha river again. The cold water is a joy. I get out, get on my cloths and run back. Through the fields and the small ditch. After the river, I take a right and arrive at camp Katanga. This is a camp where the senior rangers of the northern sector are living. We connected this camp about a year ago with the power plant in Mutwanga, so since then, this camp has electricity. I run back to the Station, take a shower and go down to the tented camp located under a high forest of jackfruit and guava trees to the peyote where the civil personal and the higher ranked rangers gather and eat. I take a little rice, sombe with macajabo and some beans. Not too much because we have to eat the pig tonight. After lunch, I walk back to my room and take a small 20 minute power nap and answer some emails. I talk with my friend Marc in Amsterdam, then Kasaï comes and knocks on my door: “dinner is ready”, he says. I open the buffet and I realize the pork meat is so nice because of the the fat of the pork, but it is quite difficult to handle in your plate. During the evening I see everyone struggling with the fat of the pig but in the end, the whole pig is gone, so I guess people also ate all the fat. I put on a slide show via a beamer. We watch my Virunga life passing by: Arrival in Rumangabo, first flight to Mutwanga, the MicroHydro power plant in Mutwanga, the electrical power distribution network, my trip to the African ‘utility week’ in Cape Town, the construction of a wall to protect the power plant in Mutwanga from floods, the construction of new power Medium voltage lines (6.6kV), the construction of Base voltage lines (380 V), the modification of the concrete wall after I found out I built it the wrong way :(, the training of Katya, Ricky and myself on the Conlog system in Durban South Africa, the arrival of the prepaid electricity vending system from Conlog, my trek with college friends up to the peak Margarethe (5119m) through the Rwenzori mountains, the first time Mutwanga is lit up by public lighting, the first time my boss asks me to look for rivers with interesting sites to build more hydro-electric power plants, my first expeditions with Zébédée, the recruitment of Emery Mbavumoja, the search for cheap but suitable motor cross bikes to find rivers, our expedition in Rutshuru, around Beni, Butembo, the Rwenzories, Lubero, Masisi and in the Nyriagongo territory. I have so many pictures and slides the evening passes by very quickly. I decide that next time I present the slide show, I should put the slides on a 1 second interval instead of 3. There are just too much photo’s, but it’s fun to watch the whole story while drinking a beer and eating a piece of pork, some Belgian potatoes with mayonnaise and some salad.